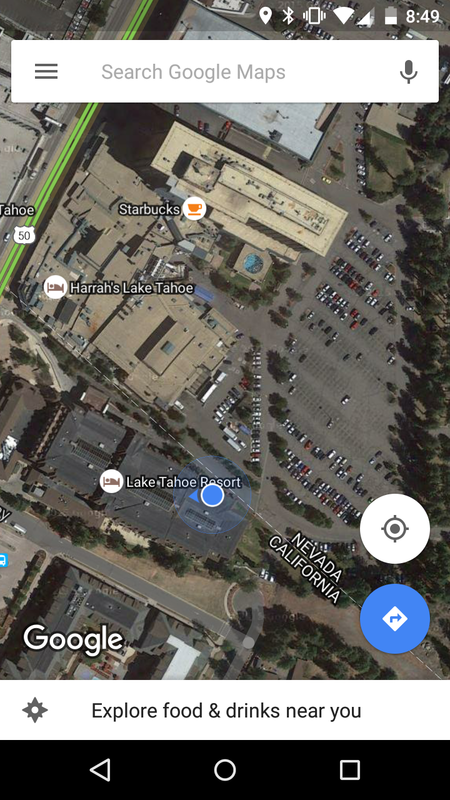 Geo Location bouncing over the border while on the 5th floor of Harrahs Lake Tahoe. Total Reward benefits is one of the advantages of playing online poker on WSOP in Nevada. In 2015, I earned over 70,000 app’s and earned Diamond Aspiration I. While I had planned on using it in California and taking a break from online poker completely, I instead decided to use it at Lake Tahoe where I could still play some on WSOP. I am determined to make Seven Stars in 2016 and figured I’d post a few hundred point days while on vacation. The Geo-location required by the regulations for online poker in Nevada had other plans. From my 5th floor room on the first 2 nights, I could no play longer than about 10 minutes before I received the dreaded could not verify your location message. Unlike a simple disconnect, this is more like a black screen of death. Any hand I’m involved in, I lose (or at best check/fold to river)* (update March ’17: This seems inaccurate currently and it now allows you to play any current hand out), and I’m instantly removed from all tables. So even if the geo-location problem is resolved 30 seconds later, I cannot win any hand I was involved in or keep my seat at a full table. The probability of this happening (1 in 10 minutes) while on the 5th floor made my expected value too low to attempt playing. Over the next 2 days, I tried to find better places to play from, like the 1st floor diamond lounge — some tips for solving geo-location issues include playing on ground level. The diamond lounge did not seem to provide any improvement. There did seem to be some improvement in the lobby vip area, but it was too noisy and distracting to try (and with the amount of time I tried playing there, it could simply have been variance). I was playing from the hotel wifi the whole time and I did not have the motivation to drive somewhere and play from other hotspots. I find these too distracting to concentrate anyway. If I cannot play from a comfortable location, such as a hotel room, I usually find it not worth it. The only exception would be when I simply must play, such as a high value free roll, high value happy hour, or when I need to earn a certain amount of app’s to finish up a bonus on time. Although I suppose the state would not allow WSOP to do this, there should be an exception to the geo-location. If you are playing on the Harrahs hotel wifi, you should instantly be approved to play! In a way though, I’m glad I didn’t get to play much. 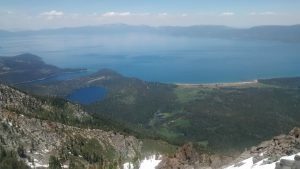 Lake Tahoe is beautiful and I managed to enjoy miles and miles of trails including a summit of Mt Tallac, one of the most beautiful viewpoints over Lake Tahoe. View Northeast from Mt Tallac summit over Lake Tahoe.